We’d love your help. Let us know what’s wrong with this preview of Helping by Edgar H. Schein. To ask other readers questions about Helping, please sign up. I'm a therapist and an educator. Reading this book was brutal in the sense that it made me painfully aware of my weaknesses as a helping professional. It was wonderful for the same reason. It provides a trains-theoretical framework of understanding the dynamics of the helping relationship at the process level. I will be a more effective helper after reading the book and practicing the simple techniques it recommends. I didn't give it 5 stars however, due to the discursiveness of some of the writing. At times it lacked crystal clarity. Anyone in the helping professions should read this book, that includes doctors, lawyer, consultants, teachers, therapists, etc; also those who are on teams or have to work with other; and anyone who has a relationship with another person should read this. That means you. The book begins with an outline of the helping relationship and the one-up or one-down dynamic. He then talks about the three helping roles: expert, doctor, and process help. An expert has special knowledge or skill that the cli Anyone in the helping professions should read this book, that includes doctors, lawyer, consultants, teachers, therapists, etc; also those who are on teams or have to work with other; and anyone who has a relationship with another person should read this. That means you. The book begins with an outline of the helping relationship and the one-up or one-down dynamic. He then talks about the three helping roles: expert, doctor, and process help. An expert has special knowledge or skill that the client doesn’t have, the doctor diagnoses and prescribes, the process help assists the client with navigating the problem in need of help. Helping should begin with the helper in the process role. Mr. Schein then gets to the key to good helping, humble inquiry. He has an excellent book called Humble Inquiry that provides more detail, but here he sketches the framework of humble inquiry. Begin with pure inquiry, which is open ended. When enough background has been shared, proceed with diagnostic inquiry. Diagnostic inquiry delves into feelings, reactions, causes, motivations, actions taken and contemplated, as well as questions about the context and effects on the system. Then, if trust is established, engage in confrontational inquiry. This involves asking why certain actions were taken and not others, as well as pushing back with possible prescriptions. Once Schein establishes the basics of humble inquiry, he works through some helpful cases to illustrate with some concrete examples. He then turns to team formation and after action feedback. Establishing team roles is foundational to success of teams as is effective feedback. Effective feedback is feedback that is solicited, concrete and specific, matches shared goals, and is descriptive rather than evaluative. He then covers the sticky area of help and leadership. How and when to help subordinates, how to help leaders, how to create and environment of mutual helping. He defines leadership as setting goals and helping people reach them. He explore implementing change (a leader’s core activity) in the context of help. Essentially, people should be helped not coerced. He concludes by providing 6 principle of help along with some specific tips. For those, read the book! Whether it be taking long term care of the elderly, team building, mentoring it even just helping a spouse pick the right evening dress, this book is absolutely enlightening and essential to providing help that is wanted and dignifying. Schein very clearly defines and frames helping as an essential social process and duly dissects this process and the agents involved to knife-point precision in an extremely concise manner. The advice dispensed throughout the books aren't always in the form of me Whether it be taking long term care of the elderly, team building, mentoring it even just helping a spouse pick the right evening dress, this book is absolutely enlightening and essential to providing help that is wanted and dignifying. Schein very clearly defines and frames helping as an essential social process and duly dissects this process and the agents involved to knife-point precision in an extremely concise manner. The advice dispensed throughout the books aren't always in the form of memorable anecdotes, but they are thoroughly convincing and easy to try. If you're looking to improve the quality of help you give in daily life without all the psychological mumbo jumbo, Schein's your man. His solutions are not only beautifully simple, but also are routinely explained and brought up time and again to help you try it out in your own life. One of the greatest strengths of the solutions mentioned is that they're all highly applicable despite being so counterintuitive. Schein's flair for empathy and assistance shines throug concise, to-the-point writing. Being an expert at dignified help, I trust the style of this book embodies that philosophy. He almost seems to hate wasting time writing unnecessary chapters as much as you hate wasting time reading them. Highly relatable and understandable, claims are almost always backed up with personal examples to ground them in reality. I recently read Helping: How to Offer, Give, and Receive Help by Edgar Schein (actually I listened to it on Audible and then read it again on kindle to better process/digest). I can highly recommend it if you are interested in ways to become a more helpful consultant, manager, person - one who is able to actually help people/organizations rather than just dispense advice/suggestions. 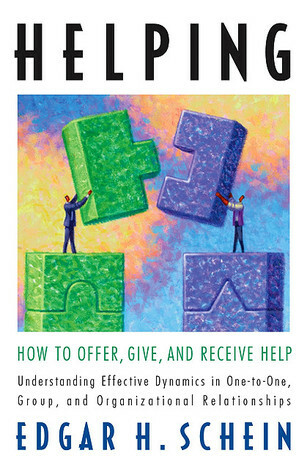 I'm not doing a full review of the book here but there are a couple of points I found very interesting in the rel I recently read Helping: How to Offer, Give, and Receive Help by Edgar Schein (actually I listened to it on Audible and then read it again on kindle to better process/digest). I can highly recommend it if you are interested in ways to become a more helpful consultant, manager, person - one who is able to actually help people/organizations rather than just dispense advice/suggestions. I'm not doing a full review of the book here but there are a couple of points I found very interesting in the relation between the Helping approach and the Kanban Method, which I wanted to put out there. The key theme in the book is that in order to provide helpful help you need to be build the helping relationship - not jumping to the expert/doctor role of dispensing advise/diagnosing but first listening, understanding, working through what Schein calls Humble Inquiry which starts with Pure inquiry - understanding what is happening without trying to influence the client in any way. Only then moving to Diagnostic Inquiry which directs attention to other aspects in the story and Confrontational Inquiry which asks what-if questions thereby hinting at suggestions (which is close to the Doctor/Expert role). "This kind of inquiry can best be described as accessing your ignorance and, because it is genuine inquiry, it is appropriate to call it humble. The helper becomes open to what may be learned through observation and careful listening. The helper’s expectations may be incorrect, and it is the helper’s willingness to accept new information that elicits trust and makes the client feel better about having a problem"
If we look at what we are trying to do with Kanban - it is quite similar. We start with understanding the system by visualizing it. Not trying to diagnose/probe too deeply before we understand - actually before the client/clients understand. Accessing our ignorance - we don't know HOW the system is working, we don't know how it SHOULD be working. Which is exactly what Schein is trying to do with process consulting - to build the understanding together, not be in a position to understand FOR the client but WITH the client. In Schein's perspective this not only minimizes the chance we will dispense generic advise based on our experience of similar events but will help to equilibarate the relationship between helper and helped - listening and respecting the situation helps the client/helped gain back "face" that he lost by asking for help. If we don't "bring the helped up" by doing this there is a chance he will "bring us down" by trying to be very critic and unaccepting of our suggestions by the way. "Starting out in the process consultant role is the most likely to facilitate status equilibration and to reveal the information necessary to decide on what kind of help is needed and how best to provide it. Only when some level of trust has been established is it possible to get accurate information that allows the shift to the expert or doctor role. As the helping process proceeds, the helper may shift among all three roles many times as the situation demands." This humble inquiry approach is also aligned with our approach towards management workshops in AgileSparks. Our instincts over the years pointed us away from diagnosing and presenting solutions and towards a more humble exploration of the system/context in parallel to presenting some useful patterns like Kanban, Scrum, ATDD. I try to emphasize the diagnostic role of these patterns/frameworks and the fact that even when we go out of the room with a decision to do something, it is basically a continuation of this "humble inquiry" (I didn't use the term until today obviously...). We are obviously shifting roles from process consultant to doctor and expert and one of my main takeaways is to be more conscious about the role I'm playing and whether it is the effective/helpful one at the moment. I'm definitely jumping to the doctor/expert one faster than I should - and I will try to work on that using some tips and tricks from the book. Eye opening book about the difficulties in helping or receiving help and in particular the social dysfunctions that can create a less than, ahem, helpful situation. Made me think differently about my approach for helping and in particular, not jumping to a solution too quickly. It is far too easy to fall into the trap of providing a solution to the problem you think you hear when in reality you've not really listened. If you work in leadership, change or consulting, this book offers excellent insights in how to be a more effective helper. This is a book of one person's observations, granted, that person is an educated "expert" but it's still just a person. Maybe that's why the field of psychology and sociology is so fuzzy. One could argue that Freud was just one person, but then one could also argue how wrong he was on so many different things. If you read thirty similar books on the same topic, all by different people, then you'd probably have a vast treasure trove of knowledge in your head, but I'm skeptical of saying I've lear This is a book of one person's observations, granted, that person is an educated "expert" but it's still just a person. Maybe that's why the field of psychology and sociology is so fuzzy. One could argue that Freud was just one person, but then one could also argue how wrong he was on so many different things. If you read thirty similar books on the same topic, all by different people, then you'd probably have a vast treasure trove of knowledge in your head, but I'm skeptical of saying I've learned something from the meanderings of just one person, especially when that person goes on and on against being in the type of helping roles that a lecturer-leader would place themselves in, in favor of one rooted in questions and inquiry, then writes a lecturing kind of book, rather than one full of self-searching questions. If you can't take and use your own advice, what value should I place in it? “In building the helping relationship, encouragement—via positive reinforcement—certainly seems appropriate. But if it is not sensitively handled, such encouragement can quickly become patronizing and insulting. Do you fully understand the situation? Have you accessed your ignorance? Is your relationship with the client strong enough for you to give advice? Does the consultant understand the situation and process abstractly and socially? Will the consultant accept confrontation? If you answered no to any of these questions, go back to the first question. Bringing in a consultant affects the social situation, and can turn into a confrontation between the consultant and the party being consu Depressing at first. A book that every parent, service professional and medical staff should integrate and commit in their daily interrelational contributions. I never realized how much we take the concept of helping for granted. If you are sincere in your desire and ability to be helpful, this short, simple book provides the MOST effective tools and strategies to be most helpful. A lot of crossover with Humble Inquiry, but a worthwhile read for anyone seeking to give and receive help effectively. I found this book unstructured, full of commonplaces and not engaging to read. Depends on personal preference, I am sure. It wasn't until the end that I appreciated the excruciating level of detail schein plumbed. The helping dynamic is complex. Helping is a complex process in which timing and sequence means everything. Overhelping and over encouragement can lead to unproductive outcomes. Until someone solicits feedback it is unlikely that they recognize the problem enough to be perceptive to any change. Some of my favorite takeaways. -Help takes on the form of process consultant (pure inquiry), doctor (diagnose and prescribe) and expert (provide specific knowledge or service). -Always unravel your ignorance by inquiring about the issue Helping is a complex process in which timing and sequence means everything. Overhelping and over encouragement can lead to unproductive outcomes. Until someone solicits feedback it is unlikely that they recognize the problem enough to be perceptive to any change. Some of my favorite takeaways. -Always unravel your ignorance by inquiring about the issue. - Provide equitable help. Focus on client's need to be helped rather than your need to help. - Always provide alternatives to the helped can still have a choice and minimize the one-down that the helped feels. - The problem is the client to own. I picked this book up because even though I have helped many people my methods of doing so did not always get the results I was looking for. This book helped me identify ideas on how to improve my methods in my efforts to help people get better at what they do in my organization. I will be applying the principles laid out in this book from this point forward because they take into account the paradoxes involved in how people Tick and react to helping and being helped! This was a well-written book, like a cross between sociology, psychology and anthropology, written for the layperson. It was very helpful to me for both my jobs, where I am constantly in the position of both needing help and offering help, as well as being a leader. Especially helpful was chapter 7, about how teams should be working together in interdependence. I found a lot of good ideas in this book, marked it up, and expect I will refer back to it regularly. I am not sure why a book that has such exciting insights on the helping relationship feels like such a drag about 80% of the way. Perhaps its the actualization of the author's principles, building a relationship -- here with the reader -- before dealing with substance. For me the extremely generic treatment of 'helping' -- basically every interaction -- was very 'helpful'. But the book itself was somewhat annoying. I'd only read the final chapter and skim the rest, if at all. highly recommended for anyone who thinks they need to help others to be a complete human being. i link it with Norman MacLean's wondrous book "A River Runs Through" which has profound Scottish meditations on how the helper and helpee rarely can meet at the right point of time and place to actually be mutually beneficial. This is a quick read of Schein's classic material on organizational leadership. I found it relatively passé. Of particular value, however, are chapters two and seven, which contain focused important elements of social learning applied to leadership. Of particular value are the references to teamwork and reciprocal social interaction. I enjoyed reading Helping by Edgar H. Schein and thought it offered an interesting perspective for workplace communication and relationships as well as offering insights that could be carried over into personal relationships as well. A good read for managers and leaders as well as anyone working in a group setting. Not many books treat the topic of providing help. This book was interesting for me since it focuses on the relationship between the helper and the one receiving help. We are all too happy to offer help without thinking about how it does to the relationship. I enjoyed this book. It could be even shorter though. Wow - what a great read for managers and anyone in a relationship. Schein's writing is so efficient and well ordered - the book is 157 pages, and has 157 pages of content - so refreshing to have a book like this without any fluff. Uses symbolic interactionism as lens. Types of help: informal, semi-formal and formal. Work on set of rules. Relationship (of social economics and theater) initiated by one person. Take time to explore the stated problem - may be something other, may really want validation. This book had a lot of good information for me in my life. It pointed out some things that now seem obvious, but needed to be pointed out to me. Schein investigates organizational culture, process consultation, research process, career dynamics, and organization learning and change. In Career Anchors, third edition (Wiley, 2006), he shows how individuals can diagnose their own career needs and how man Edgar Schein is the Society of Sloan Fellows Professor of Management Emeritus and a Professor Emeritus at the MIT Sloan School of Management.